I thought these papers would be perfect for some of my snowy pictures taken back in January. My first layout used one of the background papers that had a large floral cluster printed on it - this was obviously far too nice to cover up so I cut round it and slotted my photos underneath. There wasn't much room for anything else so I embellished the flowers with my crochet trim and the rhinestones. 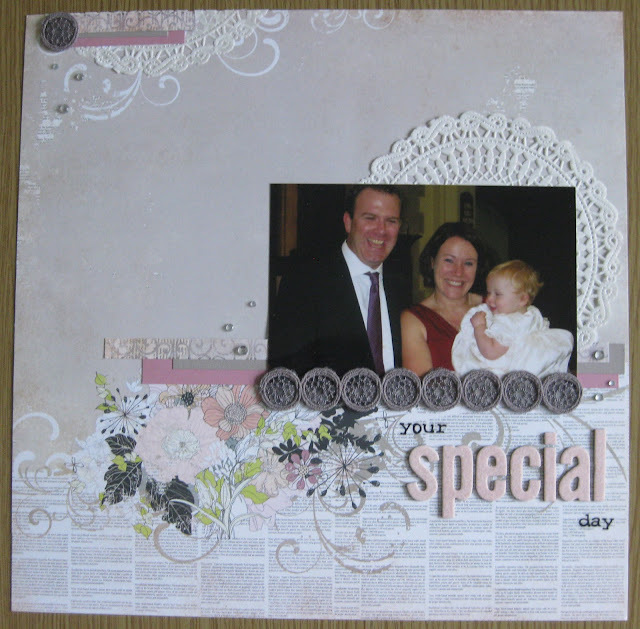 I added some punched snowflakes and a title using alphabet stickers from my stash and hey presto - a finished layout! My second layout is also of snowy pictures and again the background paper was so beautiful that I didn't want to cover too much of it up so my layout is again quite minimal. I've clustered the layout in a place that doesn't cover too much of the background and again added a few punched snowflakes and embellished using the remaining crochet circle trim and rhinestones. This week's kit costs £6.90 and can be purchased HERE and you can also subscribe in the same place for a better deal. fab layouts, love the snowman photo made me laugh. those papers are lovely.